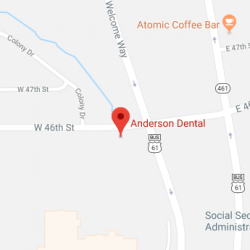 Dr. Anderson is happy to set up an initial consultation to discuss your dental situation as well as provide you with more information about his services. Below is a form you can complete and email to his office or you can call the office at (563) 355-2010 to arrange for your consultation. We are on the corner of Welcome Way and 46th St. We are on the west side of Welcome Way and share a parking lot with Bayside Tan.